Clean My Screen Clean your screen, one lick at a time. This entertaining application allows you to select photos from your library or take photos with the camera (if your device has one) to act as the screen image to be cleaned. Very clever. Who needs the love? Your best pal? A family member? Your boss? 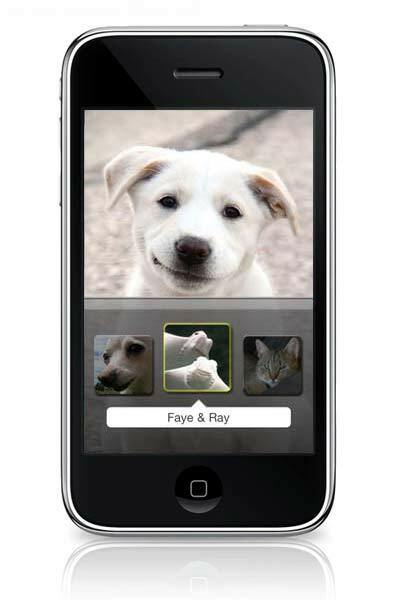 Instantly select their photo and watch with delight how they are licked spiffy clean. And then do it again. Watch the demonstration video at the right to see Clean My Screen in action. Select one of the 11 cute cleaners, six dogs, two cats, a goat or a pair of rays. 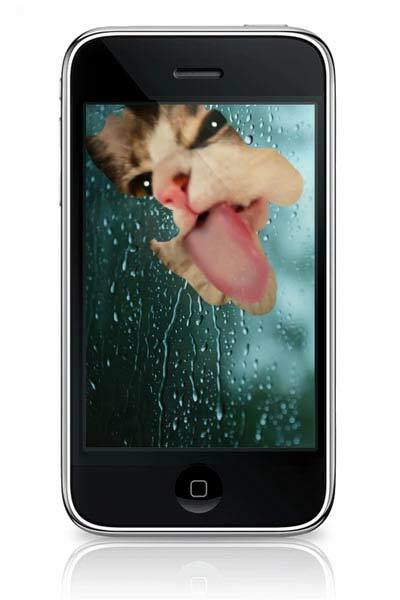 Select photos from your Photo Library or take pictures with your camera (if available) and have them licked clean. Clean Mode: let one of the cleaners lick the screen clean. 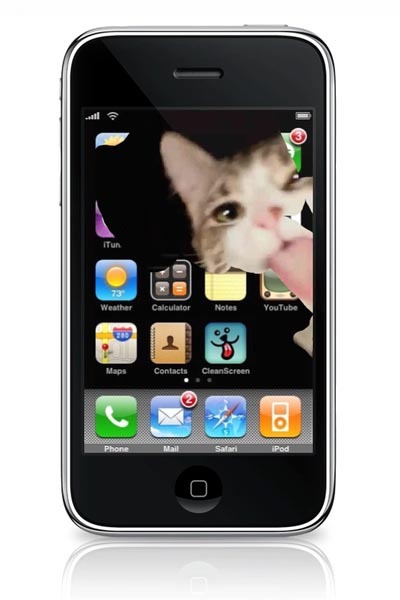 Reveal Mode: your image is revealed by the licking cleaner. Stealth Mode: hide the interface and surprise your friends. 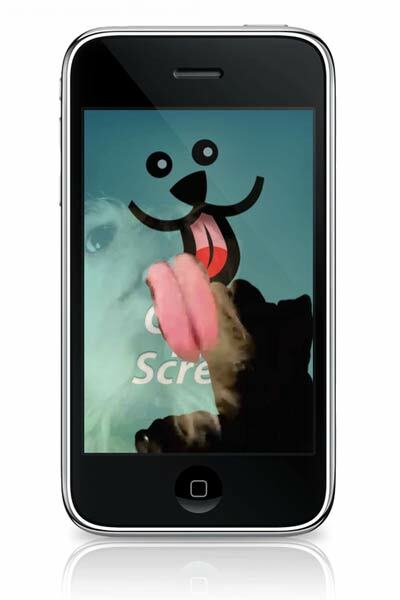 Clean-O-Gram: send your current picture to a friend, who then can have it revealed to her by a cleaner in Clean My Screen. Likes: Long walks, cleaning up baby faces, her own cubbyhole, and belly rubs. Dislikes: Children who pull and poke, thunder, sirens, and cats. Especially cats. Very talented. Licking is her day job, but she also wags, begs, and balances on three legs (just one of the boys). Extremely fast tail chaser and someday she may catch it. It won't be pretty. Very hugable. Likes barking at things but doesn't like it when they bark back. Scared of loud sounds, teenage boys and passing wheelchairs. Convinced her bosses don't feed her enough; could eat all day. Hi, I’m Maggie. I will tell you right now: I’m a napper, not a biter. But if someone comes in the room singing, “Wake up, Maggie” one more time, I’m going to roll over. I like chasing sticks, leg hugs, having people pick up my crap, rolling in interesting smells, shedding with abandon, and farting. I hate porcupines and cheap dog food. I’m here to tell you, I’m some dog! I am the original Femme Feta, my dear. And wouldn’t you agree, pigs are men? Right now I ‘m seeing an older Holstein named Fred. I just adore the way he moos me. Keeps Emily company and is a good dog too. Likes to sit by the fire and protect the yarn basket from the cat. Got her head stuck in the fence once. Even the letter carrier likes her. This handsome little fellow used to trip over his own tongue. Now he is licking his way into iHearts everywhere. Said to resemble a fruit bat minus wings, he enjoys hunting for crunchy bugs. A good boy most of the time. Did eat a newspaper once. Hi, I’m Fay! And I’m Ray! We are angels swimming deeply. Tell us, are you feeling sleepy? And will soon be sleeping deeply. and we could do this all day! Turn ons: back scratches, knitting, mobiles, warm places, and new upholstery. Turn offs: car rides, baths, vacuum cleaners, microwaves, and fast moving dogs. I'm the kitty next door. More cleaners will be added in free updates!